It was an Italian adaptation of an Argentinian comic book, filmed in Turkey, starring a former USC star fullback best-known for playing Captain America. It is definitely a product of its time—1983—so it does its best to rip-off both Star Wars and Conan the Barbarian. Yes, it is cheesy, but it is nostalgic cheese for viewers who bite into Antonio Margheriti (a.k.a. 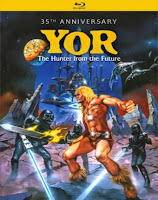 Anthony M. Dawson)’s Yor, the Hunter from the Future (trailer here), which releases today in a “special” 35th Anniversary BluRay edition, from Mill Creek Entertainment. Yor just happened to be ambling along when he saved Kala from a demonic stegosaurus. Since she is the daughter of the late chieftain, her tribe welcomes Yor with open arms, especially Pag, her grizzled protector. Unfortunately, Yor will not be enough to save her people when a tribe of pseudo-Morlocks launches a sneak attack. Technically, the Blue Meanies abducted Kala fair and square, but Yor doesn’t cotton to their ways, so he rescues her right back. Yet, just when Kala is starting to feel it between them, he lights out in search of Tarita, a reputed witch, who wears an amulet identical to the one Yor sports. Alas, the love triangle will not last long, but another oppressed tribe points Yor towards an outpost of futuristic scientists, from whom he and Tarita are descended. Sadly, the post-apocalyptic survivors are subjugated by the accurately titled Overlord, who rules with the help of an army of clones, whose armor ever so coincidentally resembles Darth Vader. Of course, there is a resistance movement that has been waiting years for a stone age barbarian to come lead them to the promised land. 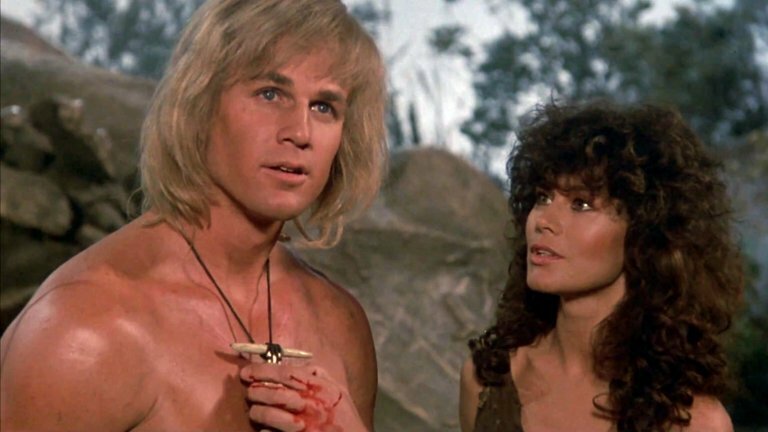 Reb Brown never really caught on, but his pageboy-loincloth-and-mukluk look as Yor is weirdly iconic. Corinne Cléry is most famous for playing the lead role in Story of O and a Bond Girl in Moonraker, so it shouldn’t be rocket science to figure out why she was cast as Kala. Ironically, one of the biggest names in the film at the time was British Giallo veteran John Steiner, who is practically unrecognizable as the Overlord. Poor Luciano Pigozzi (often billed as “Alan Collins,” as he is here) always looks like he is on the brink of a heart attack, but somehow he survived his stint as Pag. Good old Yor is definitely more cult than classic, but it still brings back fond memories of early 1980s science fiction. It would make a great triple feature with Krull and Spacehunter: Adventures of the Forbidden Zone, which also originally released in 1983. In terms of aesthetics and craftsmanship, Yor is the least of the three, but it has its cornball appeal (everyone keys in on the theme song, so we won’t even go there). 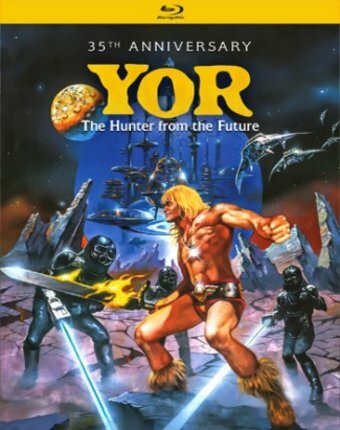 Recommended nostalgic riffing, Yor, the Hunter from the Future is now available in the unfussy anniversary BluRay edition it so richly deserves, from Mill Creek Entertainment.